Unlike dinner, I don't mind eating brunch by myself. It gives me a chance to go through my stack of GQs and work on the Sunday New York Times crossword puzzle. It does force me, unfortunately, to eavesdrop. Sure, we're all voyeurs. But can't we peek in on lives a bit more interesting? Luckily Megan Fox kept me company. 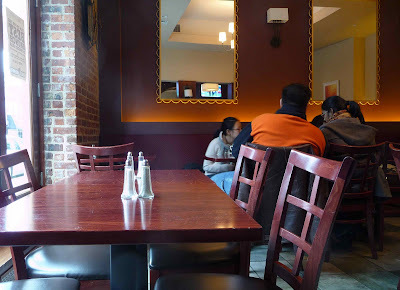 I arrived at Bonfire this past Sunday for what was my second solo brunch here and was seated at the exact same table as I sat the first time. Bonfire at brunch is loud and lively. Music plays and people enjoy themselves (even the boring ones). The first time I was here, I ordered the Salmon Benedict, an eggs Benedict with salmon instead of bacon, served with sauteed potatoes and onions. Not bad. Not at the same level as the eggs Benedict with filet mignon I got at Q, but pretty good. I ordered a coffee and the meal came with a complimentary screwdriver, which I needed to calm my stomach after nearly drowning myself in Ri 1 at a Brooklyn whiskey bar the night before. 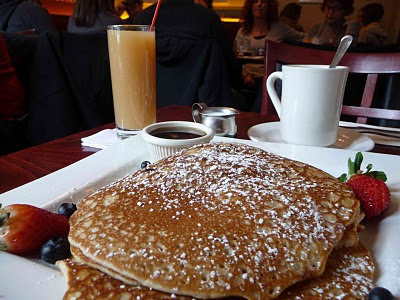 On visit two, I ordered the Uptown Pancakes with Chocolate Chips, three or four wide pancakes, dusted with sugar and served with berries. I also asked for a (complimentary) grapefruit juice and a coffee. These, while not bad, were somewhat disappointing. They were chewier than they were fluffy. It would be an exaggeration to describe it as somewhat like cutting into a rubbery yoga mat, but you get the idea. 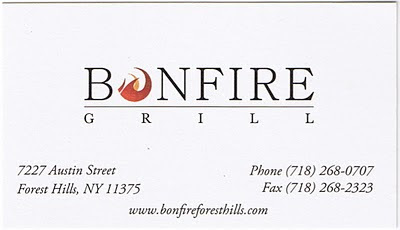 Next time, I'm sticking with Bonfire's Benedict options. Both of my visits cost the same, with tax and tip: $19.